Carte de Visite of a man identified on the reverse as George Low, husband of Ossina Pollard. The identification also mentions that George died in March 1929. 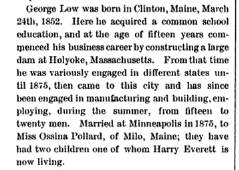 George Low was born March 24, 1852 at Clinton, Maine, son, I believe, of Francis and Mary Jane Low, who are buried in the Riverview Cemetery at Clinton, Maine. 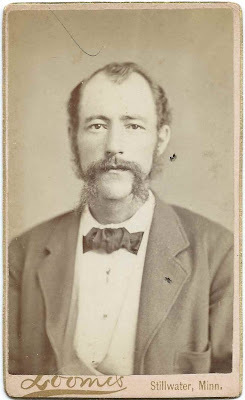 According to the excerpt above, George, at the age of 15, constructed a dam at Holyoke, Massachusetts, and then worked in different states until he arrived at Minnesota in 1875 where he had construction and manufacturing businesses. 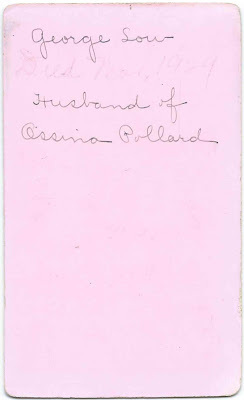 George married Miss Ossina Pollard of Milo, Maine, at Minneapolis, Minnesota, in 1875. She was the daughter of Luther Cary Pollard and Sally (Stanchfield) Pollard. Some information on George and Ossina (Pollard) Low appears in the background information for an application for a historic site designation to the Stillwater Historical Preservation Commission. The Lows had bought property in the area involved, back in the 1870s. Ossina, a florist, and George lived at 808 South First Street, Stillwater, Minnesota, and were considered prominent people in the area. George was one of the architects of the Roscoe Hersey House, built in 1879 and 1880 at Stillwater, Minnesota. By 1897, the Lows were living at Los Angeles, where Ossina is mentioned in the May 22, 1897 issue of the Los Angeles Herald as taking out a building permit for a two-story frame dwelling, Flower street, south of Thirtysixth, $3000. It was presumably this George Low who died at Los Angeles, California, on March 20, 1929. 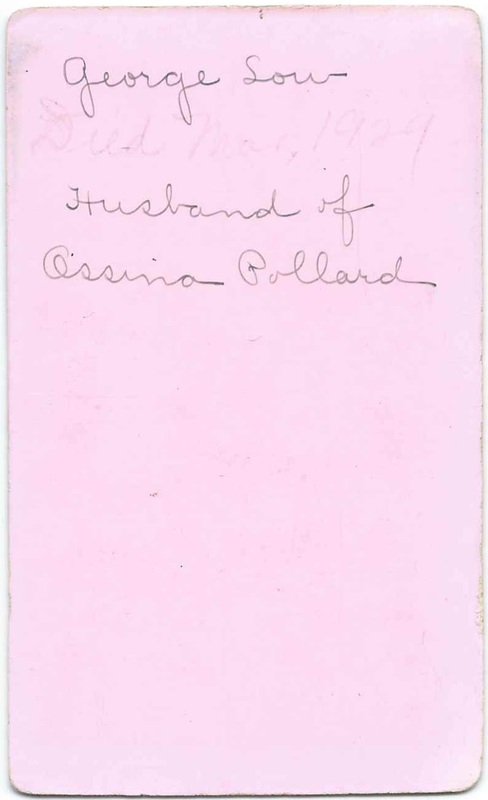 Ossina had predeceased him on April 13, 1912, also at Los Angeles.